World Wide Stereo has delivered the world's finest consumer electronics and home entertainment products since 1979. With two award winning stores and one of the largest AV design/installation departments in the USA, we know what’s good. We are an Authorized Reseller, so you can trust you’re buying new merchandise with a valid manufacturer’s warranty and best-in-class support. We live by our reputation for integrity, quality, and competitive pricing, providing you with a superior experience. For customer service inquiries or to initiate a return, please contact World Wide Stereo at onlinesales@wwstereo.com or (866) 961-7781. You can initiate a return for new and unopened items within 60 days of delivery for a refund. To qualify for a refund, items must be in new and unused condition with all original materials and/or accessories. If a return is not received at our processing facility within 30 days, it may be subject to a partial refund. You will be responsible for return shipping costs. However, if the return is a result of a fulfillment error, product defect, or damage incurred during shipping, we will refund the full cost of the merchandise. We will provide a pre-paid return shipping label for Non-Buyer's Remorse returns. All returns are subject to inspection, and if found not to be an error on our part, the return shipping costs will be withheld from your refund. SPECIAL RETURNS INSTRUCTIONS: Once the seller approves the returns request, they will provide a Returns Merchandise Authorization. Experience breathtaking 4K HDR clarity and brightness in every living space. With a dynamic contrast ratio of 200000:1 and Advanced Iris every scene springs to life with finer detail realism and deep blacks. Picture Position Memories lets you quickly watch movies in the ideal screen format. 200000:1 dynamic contrast with Advanced Iris makes every scene spring to life. With more than four times the resolution of Full HD native 4K offers 8.8 million pixels (4096 x 2160) for a picture thats so incredibly life-like its like looking at the real thing. Take full advantage of the latest content produced with HDR (High Dynamic Range) for extremely wide contrast range with an even higher range of brightness levels and volume of colors. 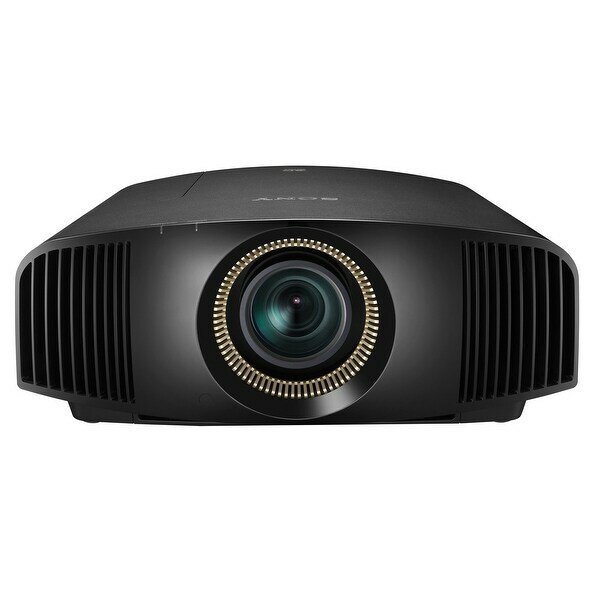 With an impressive 1500 lumens brightness 4K images are clear with bright highlights and rich deep blacks even in well-lit rooms. A dynamic contrast ratio of 200000:1 with Advanced Iris makes every scene spring to life with finer detail realism and deep blacks. Upscale your existing Blu-ray Disc and DVD movies to near 4K quality. The super-resolution Reality Creation 4K upscaler analyzes every pixel in any direction then employs a digital signal processing algorithm to map pixels against an ever-evolving picture patterning database compiled from over 10 years of expertise to enhance colors contrast and textures without enhancing image artifacts. Whatever youre watching youll enjoy a silk-smooth and razor-sharp on-screen look in fast-moving action sequences with Motionflow. This innovative technology creates and inserts extra frames between the original frames by first comparing key visual factors on successive frames then calculating the split second of missing action in the sequences. True Cinema 24p mode mimics true movie projection for cinema purists. Lens focus zoom and shift settings for up to five screen formats can be stored for easy recall. Picture Position Memories remember these settings so you can quickly watch movies in the ideal format. Match aspect ratios including 16:9 and Cinemascope and store these settings in the projector.